Sri Sri Ravi Shankar lovingly called as Guruji, the founder of Art of Living Foundation through which He relieves the stress at individual levels, thus reducing violence, sufferings and conflicts and spreading the love, harmony, peace throughout the world in various societies. Let’s talk about yoga today. You know, the definition for 'asana' is 'stable and pleasant'. You should feel comfortable when doing yoga asanas. That's why it is said, 'Sthiram sukham asanam'. Yoga is that which gives you pleasure and comfort. So whenever you do a posture, how should it be done? Prayatna shaithilya – get into a position and let go of the effort, Then what happens? Ananta samapathibhyam: infinity abides in you. So each asana should be done keeping in mind that the goal of this is not the correctness of the posture but to experience infinity. Whenever you experience joy, ecstasy, bliss and happiness in life, knowingly or unknowingly you are abiding in the form of the seer; in the nature of the seer. Otherwise, at other times, you are with different activities of the mind. What is the definition of comfort? When you don’t feel the body. If you are sitting in some odd positions then you feel those parts of the body. Your focus is more on the discomfort there. When you do any asana, first what you feel is discomfort. But if you take your mind through it, you will find that in just a few minutes the discomfort has disappeared and you feel bodylessness. You feel an expansion or infinity in the postures. How many of you have experienced this or are beginning to experience this? This is the main important thing in yoga asanas. The purpose of yoga is not only to keep a good physical shape but also to experience infinity and timeless expansion. And that starts happening to you with a little practice. What is the other definition for yoga? 'Chitta vritti nirodha tada drushta swarupe awasthanam'. This means that from the scenery you get back to the seer. Now I am the scenery and you are the seer. For me, you are the scenery and I am the seer. So I take my attention from outside to inside. So first from the environment I bring my attention to the physical body. Then I go one step further because even the body is the scenery and I take my attention to the mind. Now when I witness the thoughts that are coming in the mind, even that becomes the scenery and so I go deeper. So movement from the scenery to the seer, to the one who is seeing, everything is again another definition of yoga. If you keep just these two definitions of yoga in your mind, that’s it, you are done. The yoga sutras are very simple. They are just one liners but they are pregnant with meaning. 'Tada Dhrishta Swarupeawasthanam', which means, establishing oneself in the seer and not in the scenery. The five activities of the mind continue to exist, but having control over them is what yoga is all about. Whenever you experience joy, ecstasy, bliss and happiness in life, knowingly or unknowingly you are abiding in the form of the seer; in the nature of the seer. Otherwise, at other times, you are with different activities of the mind. You become one with different activities of the mind (vrutti sarupyamitaratra). So what are these different activities of the mind? They are, 'Pramana-viparyaya-vikalpa-nidra-smrutayaha'. The modulation of the mind are of five forms, some are problematic and some are not problematic. Five modes of consciousness arises in yourself, five modes of the mind. You can call it the mind or consciousness, it is all the same. 1. Pramana: when the mind is engaged in wanting proof. When someone thinks, 'Is this correct? How do I know this is correct? I want some proof for it', this is pramana. a. Pratyaksha: seeing for yourself; your senses tell you. You see the sun setting and if someone says that the sun never set, you say, 'No, I saw it with my own eyes'. When the senses give you some knowledge that is pratyaksha pramana. b. Anumana: guessing because of past experience. If there is some smoke somewhere, you see only smoke but then you infer that there is fire that is why there is smoke. This isanumana (guessing). If someone is behaving funny and you think, 'Someone must have told them something about me and that is why they are behaving like this', is anumana. Someone might be very busy and so they didn’t smile at you and in your mind you think, 'That person sat with that guy and that guy said something to this person and that’s why this person is not talking to me'. This is anumana. c. Agama: when it is said in the scripture. There are many people who quote the scriptures for everything. Someone quotes the scriptures and engages in violence, someone quotes the scriptures and oppresses women or poor people. In some scriptures it is written that women are not authorized to do this or that. The wrong quoting of scriptures is very common these days. Today, the cause of terrorism is the quoting of scriptures. Some people think they are doing God’s job. Isn’t this pathetic? So remember, when you do an asana the goal of your asana is to feel comfortable in that and then feel the expansion; not by wanting to feel but by letting go, by not ‘doing’ something. 2. Viparyaya: means wrong understanding. If you see, your life is full of viparyaya. You think that somebody else is thinking bad about you, but when you go and ask them, they will say, 'What? I have no time to think about you. I was busy with my own stuff'. But you thought the other was thinking something about you. This is viparyaya. Many of you have this judgment and so you're mind gets caught up in the judgment? 3. Vikalpa: means such a thing doesn’t exist at all. It exists only in the mind and a beautiful example they give is the horn of a rabbit. Have you ever seen a rabbit with a horn? Or a flower in the sky? No. This is vikalpa. These five vrittis really bother a human being. It drains the potential of a human being. Not that they are bad. These five vrittis continue to exist, but having control over them is what yoga is all about. They are like horses. If the reins of the horses are in your hands, then you can give them direction, but if you are at the mercy of the horse then it takes you wherever it goes. So it is said, 'Yoga chitta vritti nirodha', these five vrittis need to be arrested, modulated, controlled and that is what yoga is all about. And how is it done? All these different methodologies have been given in the Yoga Sutra, one option after another. It is such a scientific exposition of spirituality. Yoga Sutras is the best yoga. Be in love - Be in love and shake the world, do not get shaken. Love shakes not just the world, but the universe. 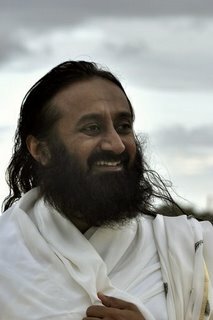 Sri Sri Ravi Shankar was born in 1956, in aTamil Iyer family in Papanasam, India. 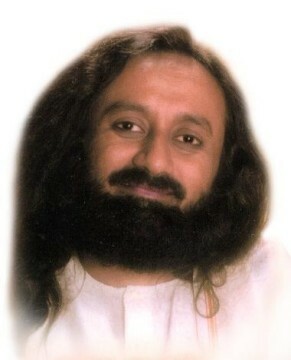 He is a spiritual leader and founder ofthe international Art of Living Foundation. 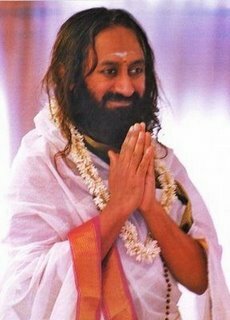 He has been the driving force behindnumerous other charitable organizations such as International Association forHuman Values and 5H.Sri Sri Ravi Shankar studied with many renowned spiritual masters - including Maharishi Mahesh Yogi who was his Guru for many years. Thus he became a student of Vedic literature. Although some of hisfollowers claim he had obtained an advanced degree in physics at 17 years ofage, there is no record of any degree or higher education that he received,however he was awarded an honorary Doctorate from Kuvempu University, Karnataka,India.